Bayani, easier than reworking the handbrake box is using a pair of metal strips between seat base and adjusting tracks to offset the seat base sideways toward the door. Not only does it fix the handbrake problem, it makes the firewall bulge less of an issue. Sure it twists the passenger a little on the seat, but thats not so much of an issue as with the driver who has to deal with pedals & a wheel. I did this to our '72 some 15 years ago when I had our stock seats rebuilt & modified. And since Judy & I trade off driving so I spend time in the passenger side, I can verify the offset does nothing serious to seating comfort. I used 1/4" thick aluminum strips 3" wide & moved the seat 1-1/2" outboard; if I were to do it again, I would angle the seat on the strips rather than keep it perfectly parallel, aesthetics aside. I just had a look at my car to make this modification, and I can't see that it is possible for me to move the seat over. I have a 74 US GTS and the passenger side seat is already basically hard up against the inside of the rockers and the seat belt attachment at the floor. If I remember correctly you have an earlier car, could it be that the seat was already repositioned a bit in the 74 model, or are the seats wider perhaps, so there is no room to move it over? In a trip to AZ back in 05 I met some Pantera boys and ran across a real nice car with these seats that had a nice look and feel. I believe he said he paid $10K or so out of a Ferrari 355 spyder, but they were real nice, low and slid on electronic rails front and rear...danm those were nice! Yup- ours is a Sept '72 car with the early seats that have removeable backs. And you're right- the early seats are narrower. IMHO they are the only 'stock' seats that should be considered for upgrades or reupholstery. The later one-piece seats have a fully welded frame thats often cracked and are not adjustable, and the Euro seats are much bigger in all directions but (to me) are no more comfortable. 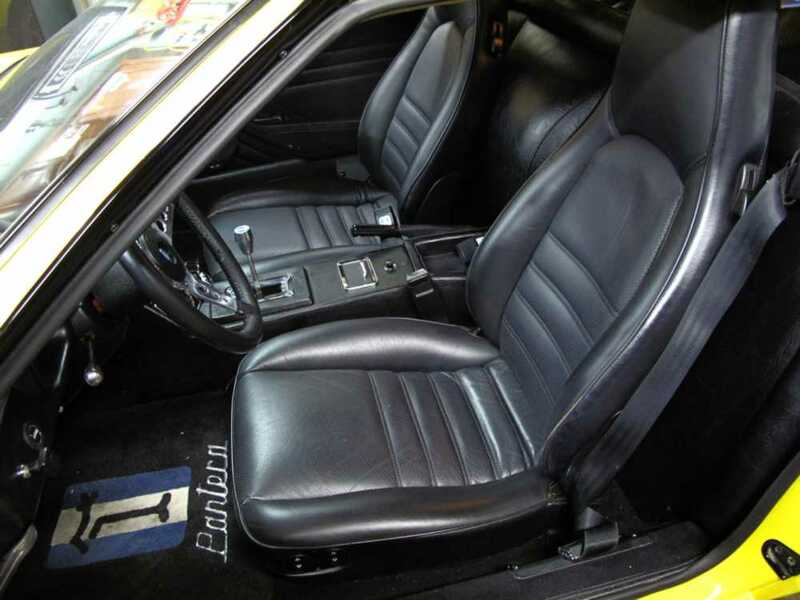 FWIW, I once adapted a set of F-car Boxer leather seats to a '73, and that was an absolute nightmare, with multiple tweaks in many places just to get them to fit and adjust. They looked nice, were low & comfortable but the amount of work needed was prohibitive. NOT recommended! I ran across a past post of yours a few months on these seats. 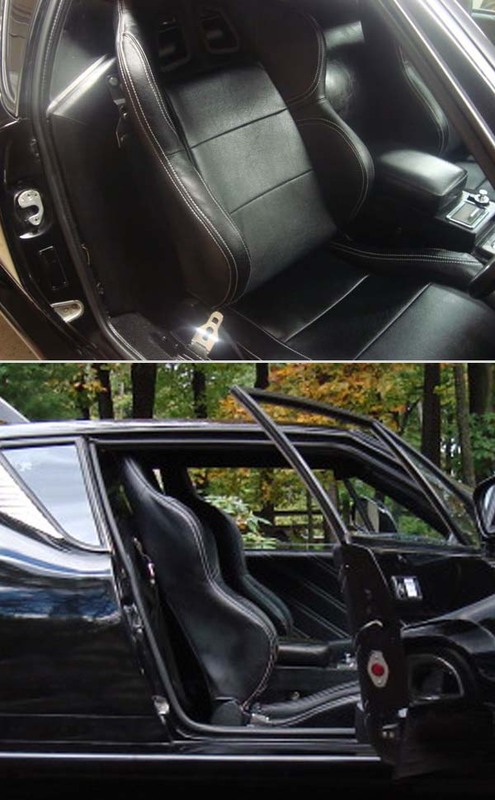 After some research, I was told they are Ferrari 348 seats. Interestingly, I have also been told that the 348 had two different style seats depending on the year. The main difference is the width of the head rest. I bid on some 348 seats in July that recently sold for just over $620 plus $136.31 for shipping. The guy also had the electric rails for sale (not on ebay) for $750 for the pair along with some Ferrari seat belts that he was going to throw in if I bought the rails. The seller mentioned a tear in one seat and a missing reclining piece but could never get me a picture of either. Supposedly he tried many times but said that they would not go through either of my email accounts. Something felt a little fishy on the deal so I stopped bidding – especially since there was only one other ebayer bidding. All the other used 348 seats I have found on ebay have been upwards of $2000 a piece. Not to mention that you may have to have them recovered to match your interior. For $4000+ for the pair they better be the most comfortable and best looking seat in the world. I do agree that they are great looking seats but unfortunately I can’t spend that much for seats. Thanks again everyone for all the pictures and suggestions on upgrading seats. Do I try to build new seats using my perfectly stock '72 seats ... or do I try to find the "parts" required to build new seats for my '72? 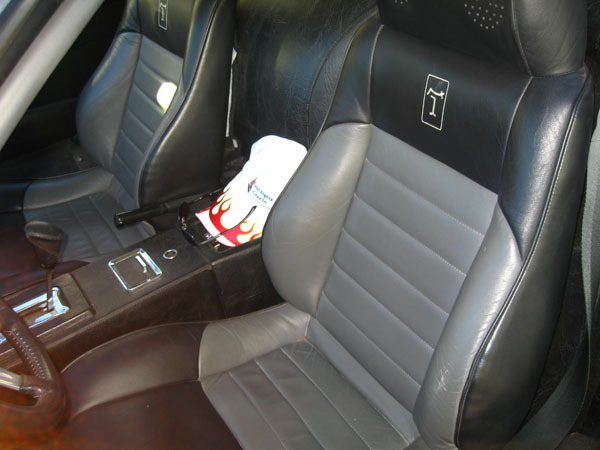 I would HATE to hack apart my stock seats *just* to upgrade to leather. OK, I have found some seats from a 1977 Porsche 924. Has anyone every tried to work with those rails before? I would like to thank Mooso for letting me stop by and check out his car this weekend. The family and I were headed to Golden, CO on Friday and Mooso’s house was on the way – well more on the way in my mind than my wife’s - if you know what I mean. Mooso’s car has Mr. Mike’s Fiero seats in it and looks great. I am a little over 6’2” and was concerned that I would not fit in the car with the Fiero seats. When I first sat in it I thought that they would not work for me. However, when I adjusted myself in the car and pushed in the clutch a couple of times I sank back and down in the seat a bit. This left me about a half inch between the roof and my head. I really like the look and feel of his seats but the one problem is that Mooso’s were mounted without rails. This would mean that my wife would not be able to drive the car since she is only 5’5”. Not that she probably will ever drive it but she would like the option. If I put the rails on I think it would raise the seat so much that my head would hit the roof. Thanks again to Mooso for taking the time to let me crawl all over his car. His Pantera is a real eye catcher. I hope mine turns out as good as his. I recently bought me a pair of 70’s Recaro’s out of an Opel – pretty easy to find (at least here in Europe), and cheap (I paid these $135). My stock seats are still OK, but they don’t give me enough support to my taste, hence I wanted others. Important to me, was to find seats with an “old” design, as imo, lots of nowadays seats don’t fit design wise in a Pantera. Pro: adjustable back, and you can “fold” them all the way forward. Contra: they are a bit heavier, but will look whether I can make them lighter. Are you able to use the Opel's seat tracks or will you have to use and/or modify the orginal Pantera sea tracks? As far as I've took a look at that so far, it looks to be more convenient and easy to use the stock tracks. The Opel tracks for sure needs to be modified, and are a bit higher, whereas using the stock tracks just seems to be a matter of drilling new holes in the seats. 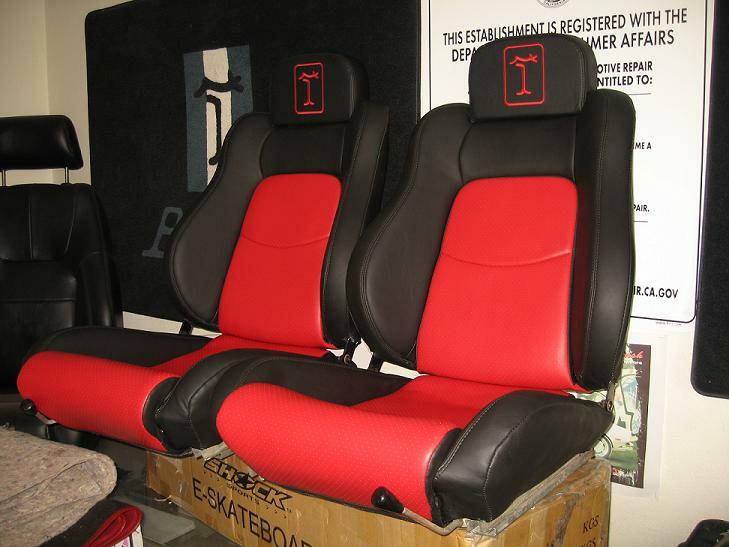 I have found some more pictures of seats installed in Panteras. Unfortunately, I don’t have any specific information on the seat manufacturers – just photos. If you happen to have any specific information please let us know. The side profile of this seat makes it look like it would be difficult to get into, not that the cars are easy to get into anyways. A little to modern for my taste, but to each his own. I stopped by a local “Hot Rod” shop recently to check out some of their seats. They had a Corbeau "Sport" seat in stock that they let me put in my car to try it out. I forgot to bring a camera with me, so I had to use my ancient and out-of-date flip phone to take a photo. Sorry about the resolution but I guess it is better than no photo at all. The seats height was roughly 32 inches tall and about 21 inches wide. It seemed to fit pretty well in the car, however, it felt a little thick in the back and lumbar areas. If I did not have such long legs and was not 6’2” tall the seat would probably be okay. Unfortunately, the back of the Corbeau "Sport" seat is quite a bit thicker than the stock seat and it felt like it pushed me quite a bit towards the steering wheel when the chair was in a comfortable slightly reclined position. So I guess that I will keep looking for other options. Any other ideas out their in the Pantera world? I just bought the Monte Carlo seats that classiccarseats.com have on their site. They are, I think, from an Italian company called BF torino and the montocarlo is called "Nurnbergring R" in their catalogue here in europe. Very nice quality seats - I got the full leather/perforated leather version - very low seats and they fit very well inside the car. I will be adapting the original pantera sliders to them. Don't forget. You can actually take the existing seat and turn it into the ultimate personal fitted seat for more modern style, comfort and performance. Using the original pan guarantees a perfect fit - tracks and all! I tried a bunch of seats and always had problems with the fit. I found the cost of redoing my interior to my exact specs and design to be the same price as buying seats. Something to think about. .....Any other ideas out their in the Pantera world? I'm 6'1". Stock floor pans. 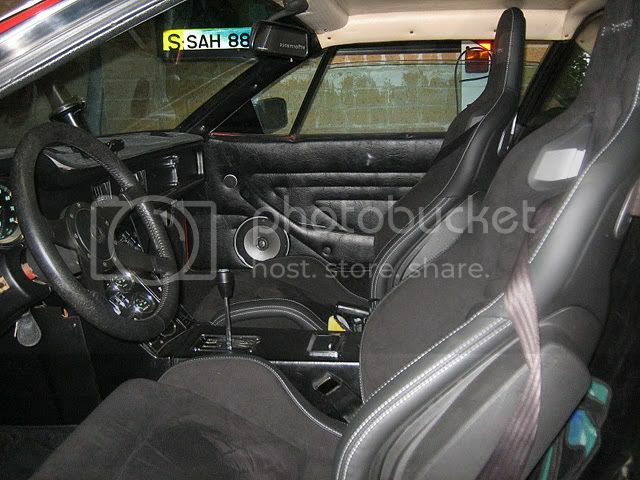 Put in a nice set of late 80's, early 90's Porsche 911, 944, 968 seats. They have a nice period look to them with the perforated leather. Had to gut them all the way down to the frame. No sliders, no motors, but a fine seat that is comfortable for hours and hours of driving, supportive, and has a proper set back latch! I have about 1" headroom. I am impressed, those seats look terrific. I hve similar seats that I would like to redo. Did you use a template for the design? Dago, that's because not too many Pantera owners have a bubble on their roof. 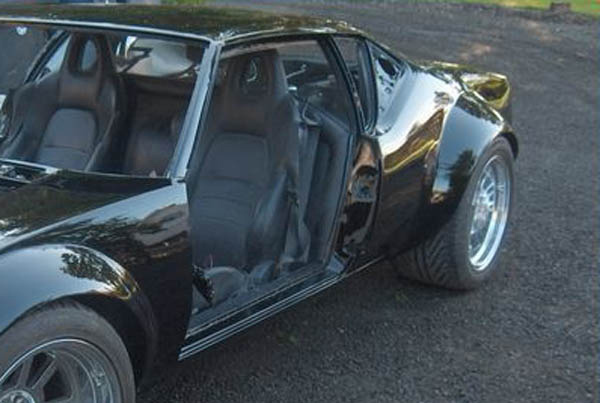 And not too many Pantera owners are 7' tall. Thought I would post some of what I have found while looking for seats for my car. I was looking for something more supportive but not full on race, since my car is going to me mostly street. I was conisdering the Corbeau TRS and CR1. The TRS was more comforatble to sit in and about 20" wide. The stock Pantera seats are about 19" wide. I took measurements and built a little mockup to test in the car and boy they did not fir all that well, but they might have been able to work. I then looked at Sparco's R100 and R505. They both look like nice seats, but not the lightest out there. Best of all they have a width of 19.6" and 19.2". These look to be a pretty good fit. My problem is that there are no shops or anything in my area (maybe Chicago or somewhere in NJ according to a distributor) to actually try out the fit of them and I am not going to buy them. 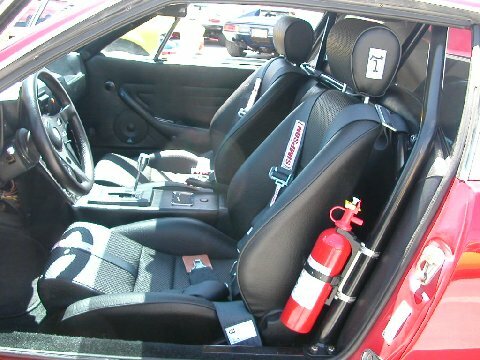 For now I found a set of Fiero seats that I am buying and going to use these for the planning stages. Not much of an investment if I choose to re-sell for something else. I will hold off on Mr Mikes skins until I am ready. My seat dilemma still continues. I just looked through this entire thread again to see if I could come up with any conclusions. 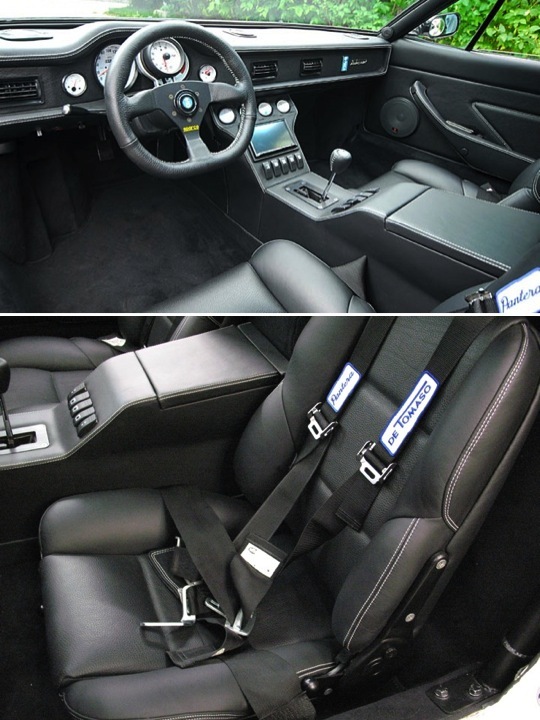 After looking at all the different options I really like the looks of David B’s recovered & recut original Pantera seats, and I also like the BMW Recaro seats that David Nunn is running. I know that for the Pantera purist that this may not be their cup of tea, but to each his own. I guess the real issue I have with the original Pantera seat is that there is no rake adjustment. My wife is only 5’5” and I would like her to be able to slide the passenger seat a little forward and recline the seat back when we take one of our long road trips to northern Wyoming (I have done the bulkhead reduction modifications so her seat will go all the way back against the firewall). I also would like the seat to fold forward and have a “map” pocket behind it (not that I will be putting maps in it). This also would make it easier to access the front of my motor. 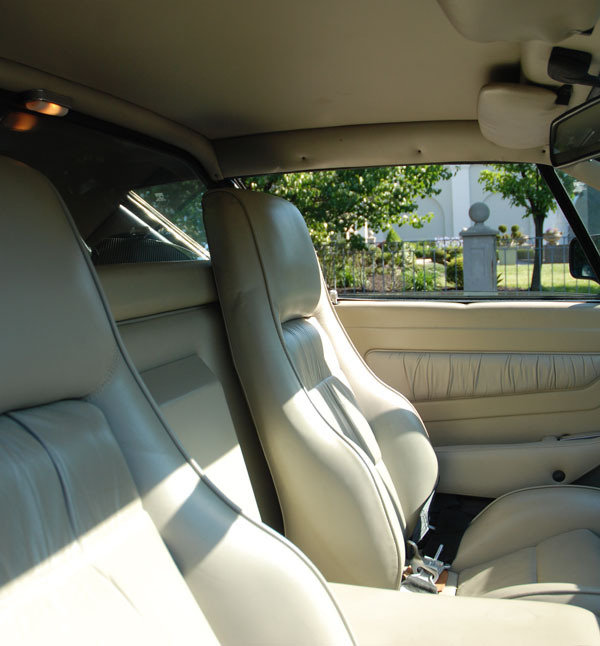 Unless there is a modification or a conversion so my seats can easily recline and fold forward I maybe stuck trying to find a reasonable decent set of BMW’s Recaros to recover. I have been watching there prices lately and they seem a bit high on the internet. I did have a chance to make a very fast stop by Pantera International last week when we were on a family vacation to Disneyland. They had quite a few Panteras, two Mangustas (very cool), a T-Rex, and a Pantera that some guy was having converted into a Audi R8 (I think I have some pics I can post later). 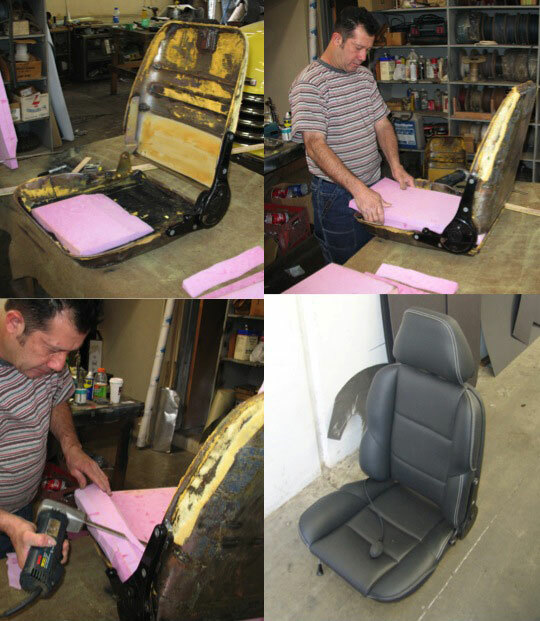 Pantera International also had a set of original Pantera seats (see pic below) that they can convert your seats into. They put in new foam, widen the bolsters, and cover them in the material of your choice. These were really nice looking seats, but once again there is no reclining or folding them forward. Thanks to the guys at Pantera International for letting look around there shop and giving me some suggestions for my car. My stock GT5 seats recline and flip forward. There are lots of these seats around, available from all the folks who switched to Recaros. Maybe take a look at this web site. 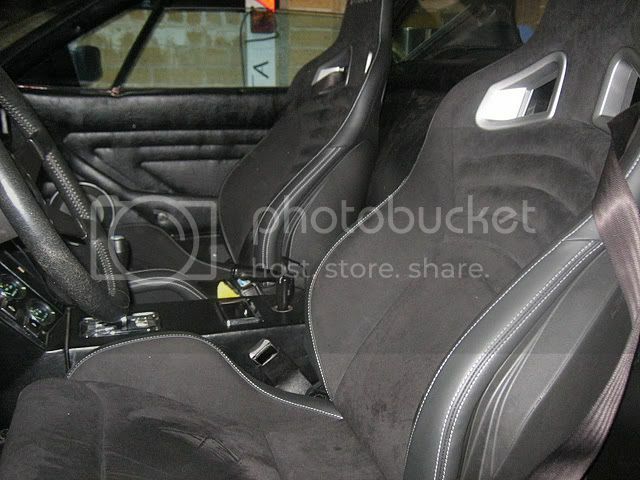 aardvarc@2002parts.com They have the BMW Recaro seats. They rebuild and cover the seats, I have a pair just like them (didn't get them there) but I did get the bottom straps there! The seats are very comfortable! There customer service was very good! you want her to able to lie down? My $0.02 is that I loved my non-reclining orig seats in my previous car. Fit me perfectly. In my new Pantera fancy seats that recline, tilt forward etc are installed. I had to remove roll bar, some of carpet, some of seat cushion, spacers, cut and reweld all handles on the seat (tilt forward and move forward), cut off one of the wheels that adjust the recline (the inner), move the handbrake ½" inwards and reinvent a cover. And am I now more comfortable than before? No. So my advice if you want new seats, is to buy seats like somebody already has in their Pantera, so you know if they'll fit, not just take the vendors word for it. Thanks David B, Cuvee, and Mikael for the information and suggestions. Also I did not realize that the newer GT5 cars had seats that actually reclined and tilted forward. So far it looks like I’ll probably end up with a newer GT5 seat or a BMW Recaro seat. Does anyone know if the mechanisms for a GT5 seat that allow it to recline and flip forward will bolt right up to a stock 74L seat and/or if they are available from any of the vendors (or does anyone have some out there in Pantera land that they want to sell)? Once again, thanks for all the help and suggestions. -Due to not functioning handles for fore/aft movement and release of seat back: Both were so low they dug into the carpet and you couldn't get your fingers beneath them, had to use a screwdriver, so I cut and rewelded in another angle. Anything more you want to know, let me know? Well, maybe the floorpans and inner rockers on my very early car are a little different than the later cars, but I had no problems installing my new Monte Carlo's (they are called NurnbergR from BFtorino in europe)in my pushbutton. I used the original sliders. I order to line up the threads on the underside of the seats I had to drill new holes in one slider and fab and weld a bracked to the side of the other - that moved them outward by about an inch. No clearence problems with the handbrake box and they move freely all the way back - and forth. I'm 188 cm (6'15")and still have about 2" clearence to the roof. Not too good a picture of the pass side seat installed. My fellow Dane, I think your seats are narrower than mine. And as far as I can see, my sliders have not been modified, they look like they fit perfectly to original holes in bottom of car. Any non-Danes awake out there? Mikael, thanks for the helpful information. Nice pictures Push 1267. 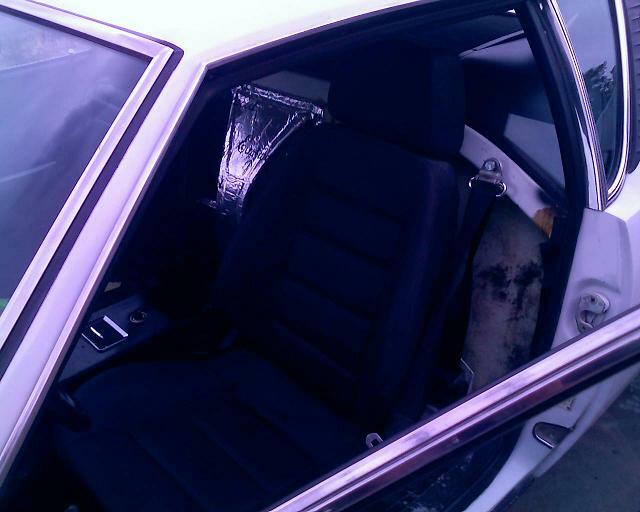 The seats look really good in your car. what's going on with your seats upgrade? if you finished it and what are you doing with the original old one? i could need it urgently. 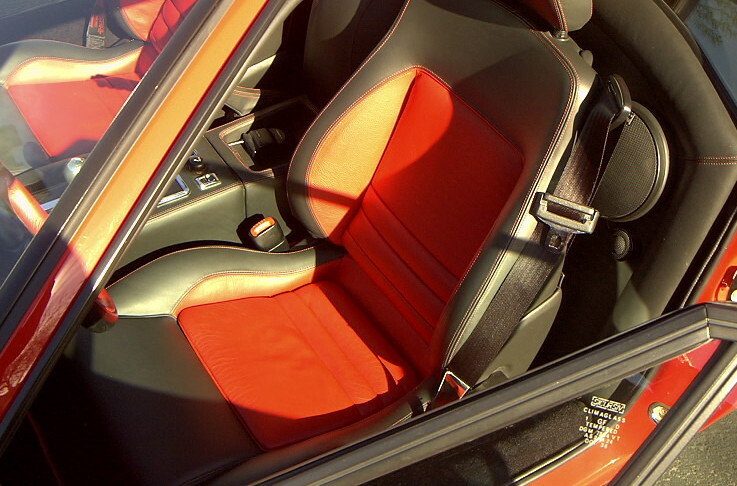 I first discovered the Ferrari 355 Spider seats on this thread on page 5 (I think). Like many of you I had been searching for seats that were comfortable and fit the car. These seats are by far the best I found. Most are too big or sit too high for a car with stock floor pans but these are a very close fit. The seatbelts are integrated into the seats so I was able to cover the holes in the rockers and ordered my bulkhead reduction kit without provisions for the rear seatbelt retractors. It makes for a clean look. I wanted to keep the ability to slide the seats back and forth so sliders were required. The Ferrari sliders are powered and I didn't see the point so I saved some money knowing whatever I used would require modifing. Sparco double locking sliders seem to be the best option. I bought 3 sets of sliders because I needed extra material to extend them. In speaking with Dennis Quella he recommended angling the seats slightly inward towards the pedals and foot well on the passanger side to make the car more comfortable. After sitting in the seats and moving them around in the car I opted to try angling them. It's hardly noticable but it does make a difference. I had to cut out the factory spacers to lower the sliders as much as possible. I had to use flat top countersunk allen bolts to clear the sliders.